Do you live and breathe sport? Imagine turning your passion into a fulfilling and exciting career. Consider the huge number of major sporting activities—V8 Supercars, triathlons, marathons and football grand finals to name a few—held every year. Sport is a central feature of Australian lifestyle, and if you're keen to help organise, manage and promote this industry, studying sport management is the ideal option for you. With a degree in sports management, you'll develop specialist knowledge of the sport industry combined with solid business skills to enable you to manage professional and not-for-profit sport organisations, athletes, sporting events and more. Griffith's sport management degrees will provide you with the sound business management knowledge and skills necessary to succeed in sports management. You'll learn from staff with qualifications enriched by ongoing research. Our academics have provided marketing and management solutions to business, community and government organisations dedicated to the delivery of sport, events and services such as the International Olympic Committee, the Australian Sports Commission and the World Anti-Doping Agency. As an Official Partner of the Gold Coast 2018 Commonwealth Games, Griffith is in a unique position to provide unrivalled opportunities for students in the lead up to, and during this major sporting event. Griffith students studying event and sport management, tourism, business, commerce, and other disciplines will have access to internships with the Gold Coast 2018 Commonwealth Games Corporation, the organising body of GC2018, and its key stakeholders. As a student intern, you'll enjoy a meaningful study-related work experience and receive credit towards your degree. Choose a second major from the Bachelor of Business or combine sport management with a major from the Bachelor of Commerce. Go on to specialise in either field or combine the two and gain a unique skill set that will give you an edge in the employment market. A degree in sport management enabled Liam Faithful to combine his love of sport with a future career. 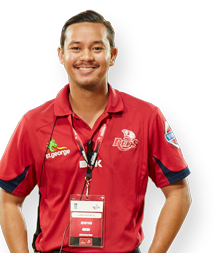 Liam complemented his studies with an internship at the Queensland Reds rugby union team, which enabled him to get a grasp on the operations of the club, undertaking everything from data analysis to event preparation. 'The highlight of the internship was definitely seeing what happens within a professional sporting club. For me, the ultimate goal is to work in a similar organisation so this was a really good stepping-stone,' he says. Liam's dream came true after graduation when he was offered a position as a sales and memberships consultant with professional Australian rugby league club, the North Queensland Cowboys. Griffith sport management graduates will find opportunities in planning and management of sporting facilities, athlete representation, event management, sports marketing and media relations, sports tourism management, project management and sports policy development. You'll find roles with amateur and professional sports clubs, anti-doping agencies, sports governing bodies, state and federal sports and recreation departments, sports tourism operators, local governments, sports broadcasters, sports stadiums and other sporting facilities, sports magazines and sports merchandisers.